Intensive moisturizing gel for the face with a universal formula "All skin in one bottle" with collagen, ceramides and hyaluronic acid from the Japanese cosmetics manufacturer Hada Labo. 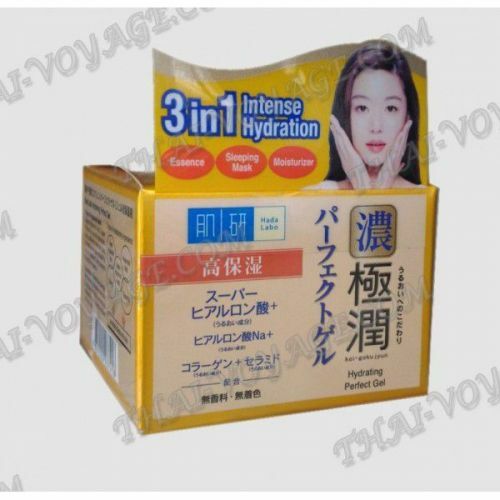 Japanese gel skin Hada Labo won the hearts of many women due to excellent moisturizing and toning the skin properties. The gel for the face with three types of hyaluronic acid Hada Labo - this means from the category "all-in-one" (replaces Lotion + Serum + emulsion + cream + mask), which is suitable for all skin types and for all ages, especially recommended for busy women . - Day Cream for skin with intense moisturizing properties - gel is very comfortable, and despite the thick texture, absorbs quickly, leaving no stickiness and shine. - As night facials "Intense Hydration", does not require rinsing, you should apply for it Hada Labo gel thicker layer to clean skin before bedtime - very good moisture and restore dry and dehydrated skin of the face and décolleté. Hydrating Gel Hada Labo contains three types of hyaluronic acid, collagen and ceramides that help to look like in our skin does not age. As part of the "ideal gel» Hada Labo contains no - perfume, alcohol, dyes and mineral oil. hypoallergenic gel.